Star Wars Rebels Season 2 comes to an epic and spectacular conclusion in Twilight of the Apprentice. I can say without exaggeration, and having seen every episode of Star Wars animation since The Clone Wars micro series, that this finale is arguably the best. Season two promised a darker turn with the introduction of Darth Vader (James Earl Jones) and Ezra Bridger's (Taylor Gray) flirtations with the Dark Side of the Force. Twilight of the Apprentice brings both of their journeys to a thundering climax of lightsaber battles. Old foes are revealed, masks are shattered, and gained. The long awaited, sorrowful showdown of an apprentice against her former master finally happens. Complete spoilers follow. Star Wars Rebels: Twilight of the Apprentice begins with Ahsoka Tano (Ashley Eckstein), Kanan Jarrus (Freddie Prinze Jr.), and Ezra on the Phantom in hyperspace. They are heading to the forbidden planet of Malachor, as instructed by Master Yoda in his vision to Ezra. Captain Rex (Dee Bradley Baker), via hologram, tells Ahsoka it's dangerous to face the Sith Inquisitors alone. Ezra agrees, but Kanan and Ahsoka feel they can no longer run from the Sith. They need knowledge about the Dark Side. Malachor holds the key to their quest. Chopper lands the Phantom in a strange crater. He warns them that sensors detect another ship is somewhere nearby. On guard, the Jedi disembark and walk towards a series of obelisks. Ezra, against Ahsoka's warning, touches an obelisk. It emits a red light, and then the ground beneath Ezra collapses. As he falls below, a new, Slim Sith Inquisitor attacks Kanan and Ahsoka. Ezra yells that he is alright, that he will catch up. As the Jedi face this new Inquisitor, he uses his circular lightsaber to create whirring helicopter blades, then flies away in retreat. The Jedi tear after him in hot pursuit. This new use of the Inquisitor lightsaber to fly was totally unexpected and very cool. Meanwhile, Ezra plods through the darkness below towards a black pyramid. A shadowy, crouched figure approaches him. Red-skinned, covered in black tribal marks, robotic legs, face hooded, and with a cane...it's DARTH MAUL (Sam Witwer)! He slyly introduces himself as the Old Master. Ezra, very wary, says his name is Jabba. The Old Master says that they are both there to seek knowledge. That he can help Ezra find the answers he is looking for. The Old Master reveals that this is a Sith Temple. One that holds a sacred Sith Holocron. Stunned, Ezra follows the Old Master to the temple entrance. Kanan tells Chopper to commandeer the Inquisitor's ship so he cannot escape. Chopper sneaks into his TIE fighter, then blasts him as he fights the Jedi. At the temple entrance, the Old Master tells Ezra that only a master and student can open the door. They take turns lifting the heavy temple doors in stages, until they enter a vast chamber with a platform in the middle. A black gulf separates the entrance from the platform. The triangular Sith Holocron is bathed in red at the center. The Old Master informs Ezra that only someone strong, willing to use their power to accomplish anything, can touch the Holocron. Ezra asks the Old Master to throw him using the Force. He reaches the middle and grabs the Holocron. The entire temple revs on with a surge of red light. The platform begins to rise with Ezra holding on. Ahsoka and Kanan look back in astonishment to see the temple rise out of the ground. While they're distracted, the Slim Inquisitor touches a beacon on his hand. The Jedi grab their captor and race towards the temple. Inside, the Old Master beckons for Ezra to jump. To have faith, that he will catch him. Ezra jumps downs, is floated by the Old Master, but falls to the ledge. The Old Master initially grabs the Holocron, but then yanks Ezra up as well. Sensing a new connection to this strange figure, Ezra tells him his real name. Ahsoka and Kanan are ambushed by two more Inquisitors, the Female and large Brute, as they approach the temple. Lightsabers flash as the Sith free their comrade and engage the Jedi. In the temple, the Old Master uses the Holocron to open the front of the temple. They see the Jedi fighting the Inquisitors. The battle stops as everyone takes in the Old Master. In a deft move, he drops his cloak, then breaks his cane to reveal his double-sided lightsaber. He proclaims, "I AM MAUL", then joins the Jedi in the battle against the Sith. Ahsoka and Kana are shocked beyond belief. Darth Maul is as bad-assed as ever. The Sith helicopter retreat under his powerful attack. Maul tells the Jedi that they must insert the Holocron at the top of the temple. He says they should split up to avoid the Sith. Kanan refuses to let Ezra go with Maul, but Ezra is unfazed. Maul is his friend, saved his life in the temple. Kanan tells him he is being manipulated. Ahsoka sides with Ezra, she tells Kanan that Ezra must face this challenge from the Dark Side. That he must have faith in his teachings to the boy. As the group splits up to ascend the temple, Maul turns to the sky. He senses that their real adversary is coming. Ezra and Maul are assaulted by the Female Sith. Maul freezes her with the Force, and then beckons Ezra to finish her off. He cannot do it. Maul kills her with a swift stroke. He then bitterly chastises Ezra for being weak. He cannot let compassion cloud his judgment or he will never truly be powerful. Ahsoka and Kanan are confronted by the two remaining Sith. Maul sees this battle, then tells Ezra to proceed with the Holocron to the summit. He joins the fight. Maul makes mincemeat of the Brute Inquisitor, killing him easily. Kanan destroys the lightsaber of the Slim Inquisitor as he tries to helicopter escape. The blades fail and he plummets to his death. When Kanan is distracted, Maul blinds him with his lightsaber. He then cackles into a diabolical monologue. The Sith Temple is actually a weapon. Ezra will activate it when he uses the Holocron. Ahsoka attacks him, but is knocked off the ledge. Just as Maul thinks he's won, Kanan puts on the mask of a mummified soldier beside him. He fights Maul blind wearing the mask. Kanan defeats him using the Force. Maul is thrown into the blackness below. Ezra reaches the summit. He puts the Sith Holocron inside a triangle of obelisks. It opens with bolts of electricity. An eerie female voice says that you have unlocked the power to destroy life. Horrified, Ezra realizes that Kanan was right. Maul had used him. Ezra attempts to remove the Holocron, but he cannot touch it. He senses something and turns around. Darth Vader is slowly floating down. Perched on top of his TIE fighter with lightsaber drawn. Vader is surprised and amused that this boy has unlocked the temple. Ezra tries to fight him, but is easily defeated. Just as Vader is about to kill Ezra, Ahsoka reaches the summit and blocks him. This moment, as they finally meet after Anakin's great betrayal, is one of the best single scenes in all of Star Wars. Vader acknowledges her skill. He invites her to join him in service to the Emperor. Ahsoka asks him what happened to Anakin Skywalker. Vader responds that he was weak, pathetic, so he was destroyed. Ahsoka seethes with rage. She will defend the honor and memory of her former master, no matter what he had become. Vader decries that a Jedi can never seek revenge. Ahsoka raises her lightsabers for battle; she is not a Jedi anymore. Insert wow at this point, this is an absolutely riveting scene. As Ahsoka and Darth Vader duel, Kanan still wearing the mask; is led by Chopper to Ezra. He tells Ezra that only a master and student can remove the Holocron. He also tells Chopper to bring the ship immediately. Ezra and Kanan use the Force together. Ezra grabs the Sith Holocron. The entire temple explodes in light and then starts to collapse. Ezra and Kanan run towards the Phantom. Chopper has the ship levitating at the edge of the temple summit. 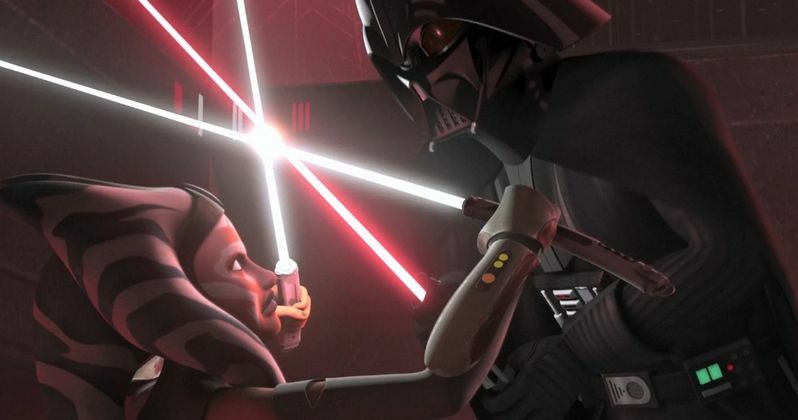 Vader breaks off his fight with Ahsoka and uses the Force to grab Ezra. Ahsoka delivers a masterful blow, slicing Vader's helmet in half. He turns to her, staring at her as Anakin. Another amazing moment as Ahsoka says that she will not leave this battle. Ahsoka and Darth Vader continue their majestic fight as the temple crumbles to the ground. Ezra, Kanan, and Chopper escape on the Phantom. Twilight of the Apprentice ends with stark omens. We see Maul flying away from Malachor in a TIE fighter. Then we see Darth Vader, seemingly injured, trudge slowly from the collapsed temple. The last shot on Malachor is of a doorway with smoke billowing out. There is a slight glimpse of Ahsoka's shadow, but she is not actually seen. Kanan and Ezra return to the Ghost at the Rebel base. Kanan is officially blind, wearing a Cyclops-like visor. The final, and most alarming scene, is that of Ezra. He is in his room. He has used the power of the Dark Side to open the Sith Holocron. Ezra's eyes burn red as he stares angrily into it. At this point, I could start breathing again. Twilight of the Apprentice had me utterly enthralled. The episode was jam packed with key developments. First and foremost, the stunning return of Maul. It seems that Ezra has found a new teacher in the ways of the Force. Ezra's path has long been clouded by the Dark Side. Twilight of the Apprentice is the first solid evidence that Ezra may indeed be seduced. Then we have the stupefying battle between Ahsoka and Darth Vader. To see these characters, inseparable during The Clone Wars, finally face each other was beyond rewarding. Ahsoka's refusal to run from what Anakin has become was such a telling moment for her character. There's no reason to believe she was killed. When Vader's helmet was cut in half, we see for the first time in this series that Anakin does indeed exist within Vader. Could this be the first seed of regret for his actions? Or will he be totally consumed by the quest for the Sith Holocron? Regardless, all of the Inquisitors we have seen were killed here. It adds the question if Vader goes on alone, or if there are other dark apprentices to be revealed. Twilight of the Apprentice is a must see for every Star Wars fan. It stands tall as a supremely entertaining piece of the Star Wars saga. Even more titillating is whether these characters have anything to do with the events of the new trilogy. Granted, Star Wars Rebels takes place years before A New Hope, but I have a feeling there are going to be multiple connections that bind everything together. Also, in full geek disclosure, it was thrilling to hear James Earl Jones voice so much dialogue as Darth Vader. Twilight of the Apprentice is a masterful addition to the canon story. I really cannot think of a better Star Wars animated episode to top this one. It's that good.